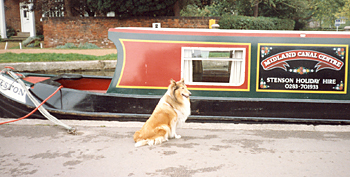 Our story began in 1981 with a rescue dog called “Bella”. with this gentle yet playful character. 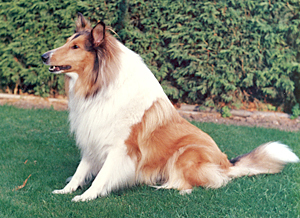 Bella was hardly a show dog, in fact it would be many years before we even thought about stepping into the show ring, but she was a collie and that was all that mattered. Being a rescue dog, Bella’s age was uncertain. We thought she was at least 10, and our vet seemed to think she had many litters. So, she was in her twilight years and we wanted her to enjoy them. 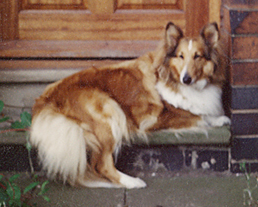 Bella was with us until late November 1984. That year was probably the ‘emptiest’ Christmas of our lives and we could not bear the emptiness that Bella left behind. 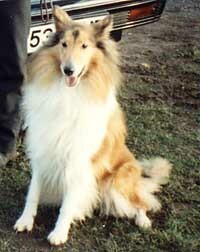 We struggled through to the new year and finally we decided we had to find another rough collie. Our first step was to contact the rescue centres - we tried Buena Vista and the RSPCA in Leicester. We found collie crosses and border collies but no roughs. Eventually we found Gamston Kennels near Nottingham who had a litter of sable and white pups. So off we set to Gamston on a cold January Sunday afternoon - and there we found Misty. At that time, we were simply pet owners, and knew very little about pedigrees, kennel club registration and so on. But, apart from a pair of pricked ears, Misty was a very flashy young lady with her full white collar, white front legs and beautiful shading. Misty’s pedigree can be viewed here. She was not KC registered. As with Bella, we took Misty everywhere with us. Her favourite activity was to go shopping in Hinckley on Saturdays. Around the market stalls were the best, because there were lots of shopping baskets to put her nose in. Our holidays had to be dog - friendly. She loved the seaside and would spend hours walking along the sea at Cromer.Another favourite was narrowboats! Having Misty from a pup taught us a lot about looking after a rough collie, and she gave us so much love and freindship in return. Misty was with us for 13 years in total before age took it’s toll. It was devastating to lose her. With us both out at work we decided it would not be right to bring up another pup at this time, and so it was not until our circumstances changed in 2002 that we could have another dog. Thanks to his employer closing the Birmingham office, John would have to work from home. And this meant we could look after a pup. But this time we had the internet available. It was not long before we found Collienet.com and could see so many pictures and read descriptions of all the breeders.It wasn’t long before we had a shortlist of who’s dogs we liked. At the top was Sue and Dave Randall’s Ladnar kennels.Also, they lived in the next village and after a telephone call we arranged to pay a visit. And so, although we did not know it at the time through that visit to see Sue Randall, the next part of our journey began! around Sandringham to break the journey!